Iconic contender Rocky Balboa comes out of retirement yet again in this latest installment of the long running boxing franchise. 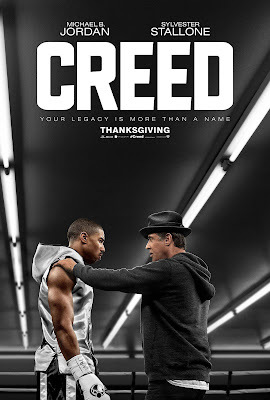 While 2006's Rocky Balboa was a perfect swan song for Rocky's career, in this entry Rocky (Sylvester Stallone) passes the torch to young Adonis Creed (Michael B. Jordan). Adonis is the son of legendary Apollo Creed, the boxer Rocky fought in the original 1979 film. Adonis, known as Donnie among his friends, was fortunate enough to inherit a portion of Apollo's wealth. In the boxing world, however, wealth is hindrance. Frankly, rich kids don't fight professionally, and boxers view wealthy contenders as posers. Donnie must shed his "Hollywood" persona if he's going to be taken seriously. Donnie must also step out of his father's shadow. Apollo Creed was one of the best of the best in boxing, and Donnie needs to prove to the world - and to himself - that he can live up to the family name. Because of his reputation, few notable trainers will touch him. On a wing and a prayer he heads out to Philadelphia to meet his father's biggest rival in hopes he will train him: Rocky Balboa. Along the way he meets colorful boxers and catches the fancy of an underground musician, Bianca (Tessa Thompson). She loves to create electronic music, but she also suffers from progressive hearing loss. On the stage or in the ring, everyone fights time. Boxing has always been a metaphor for confronting life's challenges, and the characters in Creed do so here. All of the Rocky films demonstrate a heartfelt masculinity. Rocky might have been a tough guy in the ring, but he never shied away from showing his big heart. Creed thankfully keeps this tradition as Donnie navigates boxing and life in the 21st century. For fans of the series, Creed is a little bit of an interesting conundrum. It's a high quality boxing film containing all of the elements that made the other entries great. Yet Rocky Balboa, the 6th entry, was intended to wrap up the Rocky story. While, yes, this film transfers the focus to Donnie, it was a little disappointing for Rocky's son not to make an appearance after they made peace in the previous entry. The Rocky films continue to go the distance. It's interesting that the numerous installments became a joke in Hollywood sometime in the 80s. Yet now every studio and creative aims for the next big franchise, and perhaps the Rocky franchise was ahead of its time. It remains to be seen if Creed 2 will retain the level of quality here, but there's a good setup to make it happen.